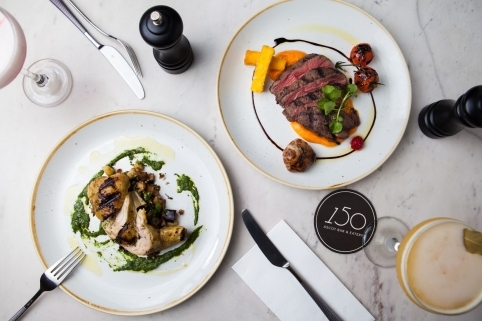 If you would like to start planning your next corporate event at One Fifty Ascot Bar & Eatery, please complete the form below and a member of our team will be in touch with you. 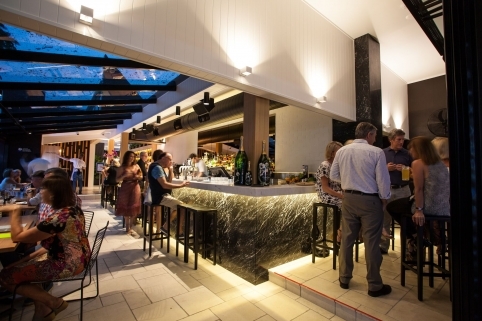 When business bites, leave the office behind and head to Brisbane's best corporate function venue. 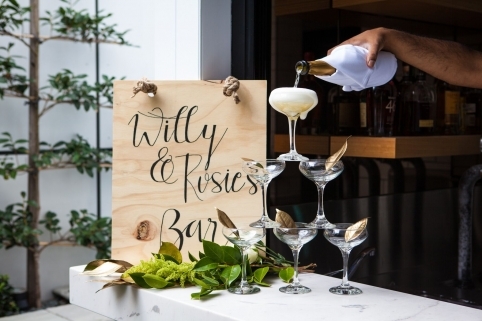 One Fifty Ascot Bar & Eatery can host corporate functions for up to 135 seated guests, or 250 stand up guests. Please complete the form below to download our corporate function packages. Elegant and reserved, One Fifty acts as a professional yet vibrant space for your next corporate event. Exclusive venue hire is available for large corporate functions with space for up to 135 seated guests, or 250 at a cocktail-style event. Whether you're looking to hire a meeting room for the board, or an office Christmas party, we have a range of corporate function spaces available for your next event. Escape the office to the open-air charm of One Fifty’s street-front space. 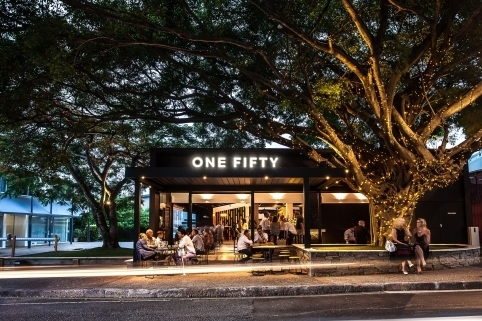 Dine underneath the iconic fig tree for your next client meeting or lunch conference. 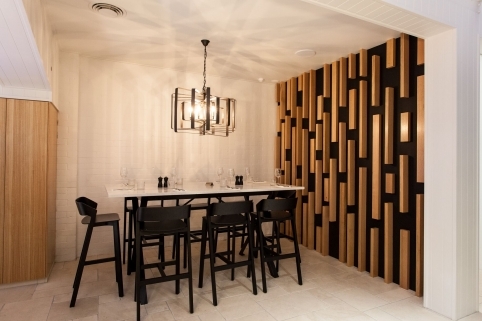 With its marble tabletop and hanging pendant light, the Carrera is a modern dining room styled to impress. 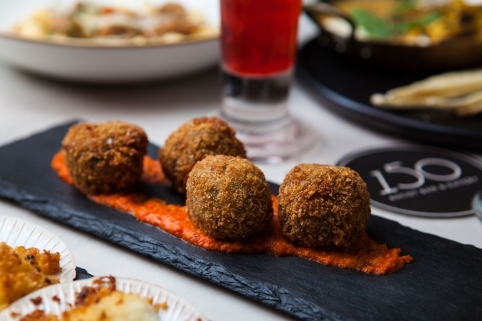 Mingle over drinks or casual share plates at your next small-scale corporate event. Escape the office atmosphere within this open-air retreat. 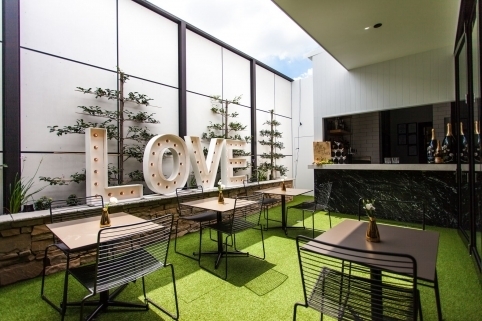 Styled for a cocktail garden party, the space is ideal for social events with coworkers or clients, and includes its own private bar. For meetings without interruption, dine in luxury at One Fifty’s private dining room. With sleek slate walls and AV capabilities, this room is well-suited to intimate presentations and high profile meetings. Take larger corporate functions into the expanse of One Fifty’s full dining room. The chic, open space specializes in transforming regular office events into grand, elegant occasions. 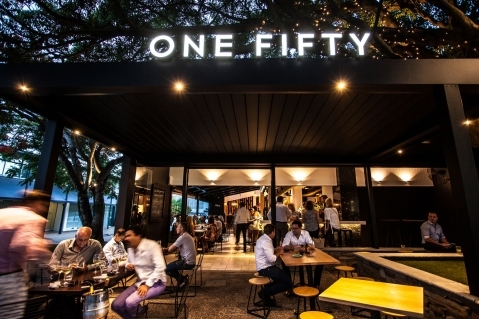 One Fifty’s dining room can be combined with the courtyard space for full venue corporate functions. Our venue will help to bring guests together in one all-inclusive area. Networking is one of the most important elements of any corporate event. Socialise over canapés and more substantial mini-meals with One Fifty’s assorted cocktail-style packages. Each occasion is unique. 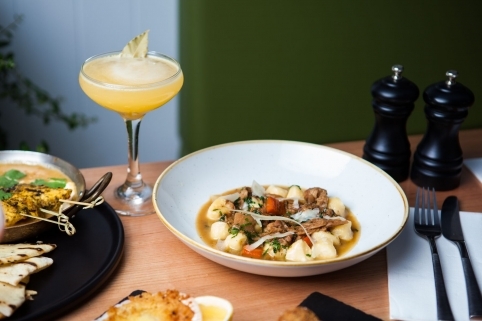 Tailor your meal to your corporate occasion with One Fifty’s two-course set menu, offering decadent selections of entrees and mains OR mains and desserts. For extended corporate functions, One Fifty’s lavish three-course set menu offers the chance to linger. Dine in style with entrees, mains, and desserts of your choice. Please note groups of 29 or more will be served as alternate drop. One Fifty’s basic beverage package offers a snapshot of the venue’s fine beer and wine selections for your next corporate event. This package offers 2-4 hours of all-inclusive beverages from $45pp. For a greater taste of what’s on offer, pair your corporate lunch or dinner with One Fifty’s premium beverage package. 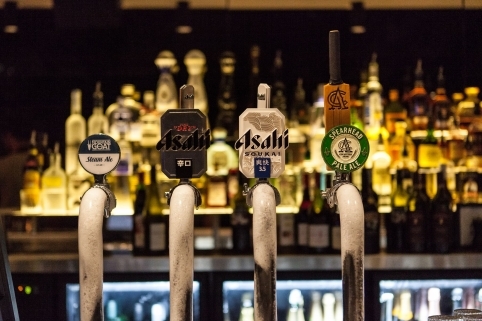 Starting from $55pp, guests are treated to additional beer and wine selections. The height of luxury awaits with One Fifty’s deluxe beverage package. 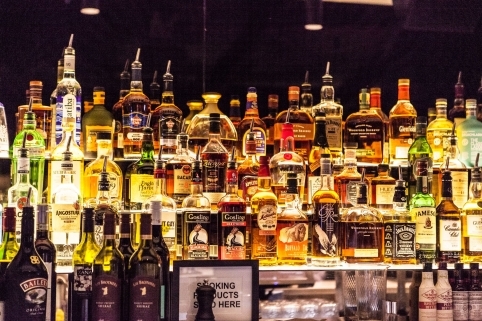 Attendees to your corporate event will sample the finest selections from the bar, starting from just $75pp. Do you require additional styling and theming for your launch party or office festivities? We frequently work with Brisbane’s leading event suppliers and stylists and can recommend the finest services for your corporate event. Our staff can also assist with any required entertainment or equipment hire necessary for the day.